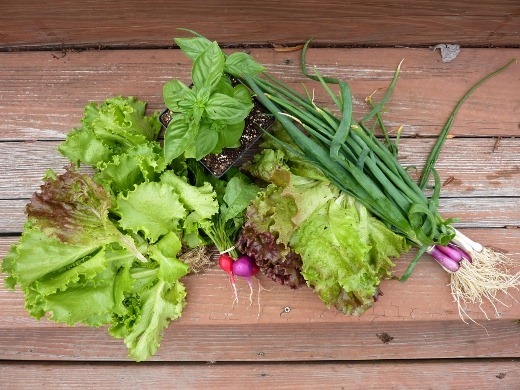 Today I picked up something that I have been eagerly anticipating for some time now – our very first CSA box! Earlier this year I decided that I wanted to purchase a share in a local Community Supported Agriculture (CSA) program, and after some research, decided to purchase a half share from Two Creeks Organics, a local family Michigan farm located in Manchester. Today after work, I went to the Westside Farmers Market, located in the Zingerman’s Roadhouse parking lot, to pick up my box of produce. I had an idea of what to expect due to a CSA newsletter sent out to all the members earlier this week. Basil plant (in memory of Mr. Basil!) What should I name him? Radishes are so pretty! 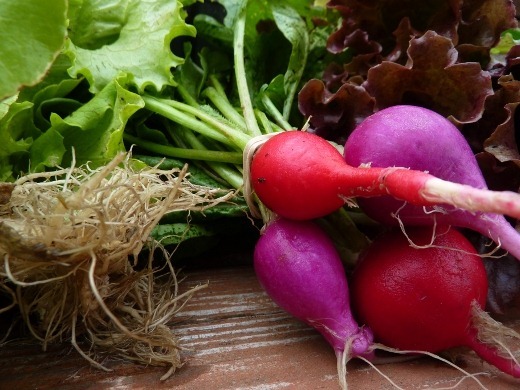 Growing up, I always used to help my dad with our family garden, and radishes were my favorite veggie to harvest – even though I wouldn’t eat them as a child! 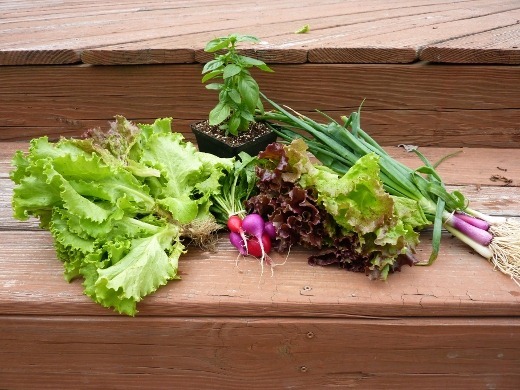 I had a big elaborate single-manned assembly line with multiple stations, involving picking, transporting to deck, chopping off the greens, and mass-washing them with the hose. YES! What shall I do with these guys? Make a dip? Just salt + crunch ‘em raw? 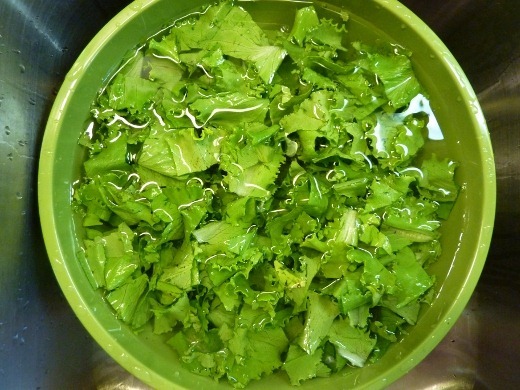 For dinner, I sliced the roots off of some of the green leaf lettuce, chopped, and washed in a large bowl, letting the dirt float to the bottom of the bowl. 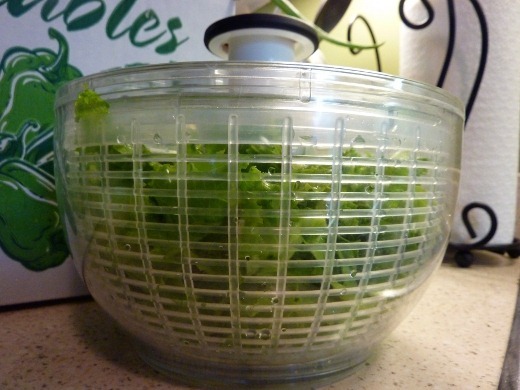 Salad spinners are handy in such situations. 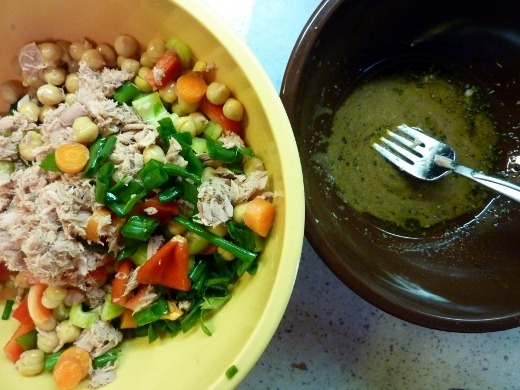 To top the lettuce, I mixed together a bowl with some of my CSA scallions, as well as chopped red bell pepper, carrots, celery, chickpeas, and canned tuna. I dressed this mixture with a dressing consisting of EVOO, balsamic vinegar, Dijon mustard, dried basil, and salt, and then topped a heaping bowl of lettuce with this topping. On the side I made something that I have been obsessed with lately – Greek Yogurt bowls. I plop Greek yogurt in a bowl (preferably Fage brand), top with sliced berries (strawb and rasp, in this case), a palmful of something crunchy, and drizzle with honey. This dinner was so fresh and tasty! 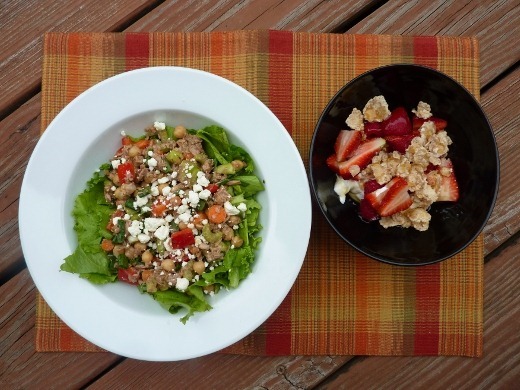 I just felt healthy eating it – full of so much goodness. I love that my bowl of lettuce was grown just miles away. After dinner, I fulfilled my hankering for a long (to me!) run and ran 3 miles in 28:49 minutes. Faster than Sunday’s 5K – but the weather was much cooler! A great running night. I’ve decided I can’t let any nights go to waste this summer – if it’s good running weather, then run, I must! I was unable to the last two days because of the 90+ degree weather. Wow, it felt so good to run tonight – dare I say, therapeutic? It’s becoming addicting. Pingback: Under The Sea Bang! « Meg.Goes.Nom.Nom. Pingback: CSA–Week 3 « Meg.Goes.Nom.Nom. Pingback: Summery Summary–PART I (Travel, Events, Etc.) « Meg.Goes.Nom.Nom.